The map above shows all the locations where CloudFlare is actively working to turn up data centers over the next 12 months. This entry was posted in CDN, Cloud, Computer, Murmuring, Network, Security, WWW and tagged cdn, china, cloudflare on September 29, 2014 by Gea-Suan Lin. It's funny for me to read that Amazon is notifying its users of an impending reboot. My personal favorite Azure feature, is that SQL Azure randomly drops database connections by design. Let that sink in for a while. You are actually required to program your application to expect failed database calls. This entry was posted in AWS, Cloud, Computer, Murmuring, Network, Security, Software and tagged advisory, amazon, aws, cloud, ec2, security, xen, xsa on September 27, 2014 by Gea-Suan Lin. Today on Amazon, a Seagate 3 TB “enterprise” drive costs $235 versus a Seagate 3 TB “desktop” drive costs $102. 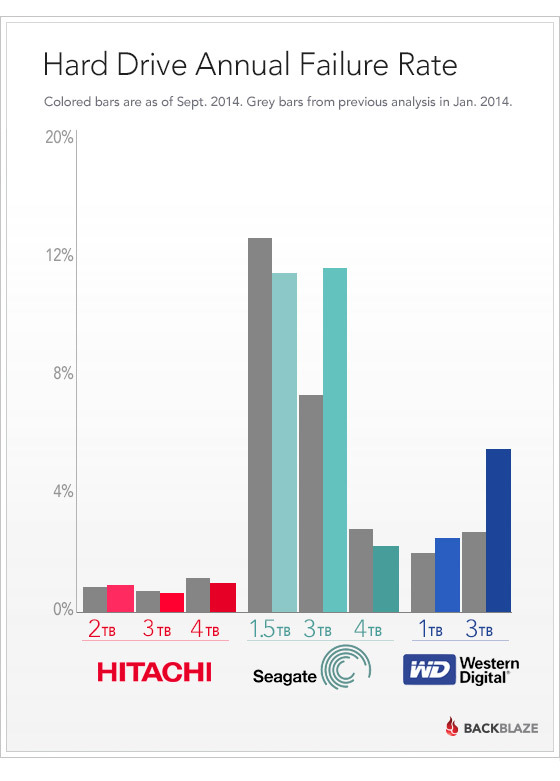 Most of the drives we get have a 3-year warranty, making failures a non-issue from a cost perspective for that period. However, even if there were no warranty, a 15% annual failure rate on the consumer “desktop” drive and a 0% failure rate on the “enterprise” drive, the breakeven would be 10 years, which is longer than we expect to even run the drives for. The assumption that “enterprise” drives would work better than “consumer” drives has not been true in our tests. I analyzed both of these types of drives in our system and found that their failure rates in our environment were very similar — with the “consumer” drives actually being slightly more reliable. This entry was posted in Computer, Hardware, Murmuring and tagged backblaze, disk, drive, harddisk, hd, hitachi, seagate, wd on September 27, 2014 by Gea-Suan Lin. Debian and other GNU/Linux vendors plan to disclose a critical, remotely exploitable security vulnerability in bash this week, related to the processing of environment variables. Stephane Chazelas discovered it, and CVE-2014-6271 has been assigned to it. This entry was posted in Computer, Murmuring, Security, Software and tagged bash, code, cve, execute, linux, remote, security, shell on September 25, 2014 by Gea-Suan Lin. You can use a 12-watt iPad charger to juice up the iPhone 6 and iPhone 6 Plus in half the time when compared to the 5-watt iPhone charger your device ships with by default. This entry was posted in Computer, Hardware, Murmuring, Telephone and tagged battery, charge, ipad, iphone on September 24, 2014 by Gea-Suan Lin. This entry was posted in Computer, Financial, Murmuring, Network, P2P and tagged bitcoin, braintree, currency, p2p, paypal on September 24, 2014 by Gea-Suan Lin. This choice has bitten us in the form of gem incompatibility, having to manually backport security patches, missing out on core framework performance and feature improvements, and being unable to easily contribute back to the open source rails project. Over the last six months, we’ve had a team of 4 engineers working full time on upgrading to Rails 3. This entry was posted in Computer, Murmuring, Programming, Software and tagged github, on, rails, ror, ruby on September 21, 2014 by Gea-Suan Lin. This entry was posted in Computer, Murmuring, Software and tagged font, google, noto on September 21, 2014 by Gea-Suan Lin.